With Ant-Man, Marvel closes out its “Phase 2” line of films – basically, anything that came after the first Avengers movie – not with a bang, not even with a whimper, but with a very tiny crackle of electricity which may not seem particularly impressive in comparison to what came before, but is more fun than you might expect. It’s an interesting change of pace from the traditional Marvel movie, which usually climaxes in a city-wide thrust of destruction with the hero fighting the villain whilst protecting the innocent civilians. This one, rather appropriately, is a lot more small-scale than some of the other movies, and manages to generate its own charms well because of it. 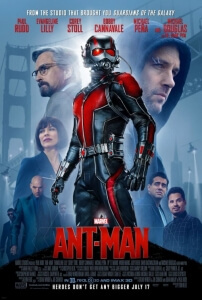 We see thief Scott Lang (Paul Rudd), an ex-convict who wants nothing more than to be there for his estranged young daughter, become involved in a scheme by former S.H.I.E.L.D inventor Hank Pym (Michael Douglas) to pull off a heist in Pym former company now run by his protégé Darren Cross (Corey Stoll). The catch? Lang has to wear a suit that allows him to shrink down to ant-size and use special technology to telepathically communicate with various types of ants. Why yes, it DOES sound rather silly. But one thing you have to remember, Ant-Man was one of Marvel’s many characters from the 1960s period, when stuff like this was meant to be incredibly silly. In addition, Marvel has now gone to such lengths to suspend our disbelief that we have just accepted that in this cinematic universe, there is not only a man wearing an iron suit, not only a WW2 genetically-enhanced super-soldier that was frozen and thawed out into modern day, not only is there a talking raccoon and tree duo causing chaos in the cosmos, but now there is a special kind of technology known as “Pym particles” that can allow people and objects to be shrunk down and become somehow stronger and faster. This is a universe where all of that is now possible, so it should come as no surprise that it is a bit odd – it’s just the matter of how it’s executed that determines whether or not it succeeds at being odd or not. Peyton Reed, who replaced Edgar Wright as director last year after “creative differences” forced him to bow out after nearly a decade of development (though Wright is still credited as a co-writer and executive producer), never tries to mirror Wright’s unique directorial style, but still brings out a sense of colourfulness and imaginative joy that fans of the Cornetto Trilogy director will instantly recognise. Reed is certainly a game director for the MCU, handling both the traditional Marvel tropes and the unique set-pieces very well, but one cannot help but ponder on the Ant-Man movie that could have been with Wright still in charge. Odds are, with how the final product looks and acts, it would have been one of his least unconventional films to date, but still charming enough to get by. Much of that charm comes from Rudd as Scott Lang, who is a fully likable character that never gets annoying or loathsome like he could have so easily been in the hands of a lesser director. Rudd’s Lang is one of the few heroes in the MCU thus far that is both a convict and a father, to a young girl named Cassie (Abby Ryder Fortson) who lives with his former wife Judy Greer and her new partner, cop Bobby Cannavale, and it’s this humanizing element that helps Lang become the kind of hero you want to see succeed. In fact, it’s exciting now that we know that Rudd will be reprising his role in the forthcoming Captain America: Civil War, because – like a lot of Mavel’s crossover flicks – we are eager to see Lang interact with the likes of Steve Rogers, Tony Stark and others, and watch their differing personalities bounce off of each other (there is a sequence around the mid-way point that teases this, where Lang arrives at the Avengers’ new headquarters as demonstrated at the end of Age of Ultron and is confronted by the surprise appearance of a previously established MCU character). The heist itself is pretty entertaining, though not as ground-breaking or even as memorable as, say, the Ocean’s Eleven films, and the action in this one is also a lot of fun, especially when they play around with the shrinking capabilities of its lead character (let’s just say that Thomas the Tank Engine has a much bigger role than it may seem in the trailer). There are some connections to the rest of the MCU that don’t entirely work, like a prologue sequence that sees the return of Hayley Atwell and John Slattery as an aged Peggy Carter and Howard Stark respectively isn’t entirely needed (though it does feature some pretty good de-aging effects on Michael Douglas) nor is the late inclusion of a certain rogue organisation, but they’re very few in between. The aim here, of course, is to form a gentle and small-scale close to Marvel’s Phase 2, and Ant-Man manages to be a perfectly fine and entertaining addition to the MCU which, though not as spectacular and instantly memorable as The Avengers or Guardians of the Galaxy, is able to charm and have fun on its own accord. Ant-Man may not be Marvel’s grandest film, but it is certainly an entertaining heist film led by an endlessly charming Paul Rudd who acts as our guide through a series of fun set pieces and action sequences that director Peyton Reed is more than able to execute decently, especially within the shadow of former director Edgar Wright who one wonders what he could have brought to the table had he stayed on.